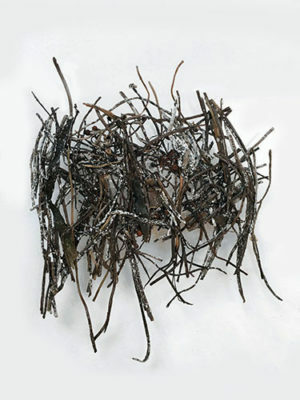 Installation view: "In my end is my beginning." Dimitra Skandali gives lie to the old saying, “a rolling stone gathers no moss.” The artist, who divides her time between San Francisco and far-flung artist residencies, often uses sea plants gathered from her travels to express an unfathomably deep affection for ocean waters, particularly those surrounding the Greek island of Paros, her birthplace and spiritual touchstone. environment the trappings of a low-grade horror movie scented with sea musk. It won her SFAI’s best-in-show award. 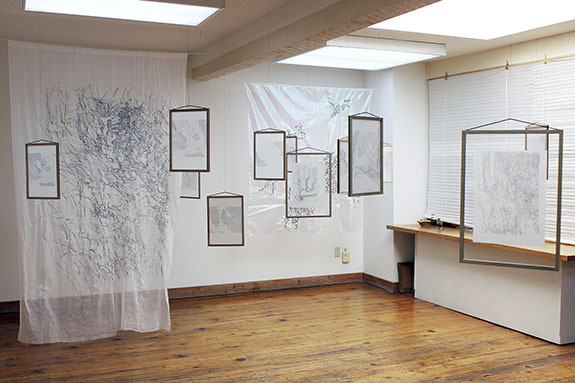 Her output today, which has appeared in solo exhibitions in the U.S. and abroad, ranges from intimate map-like drawings and delicate small-scale seaweed-on-glass sculptures to installations involving, sea plants, fabric, embroidery, painting, soundscapes and projections of light and moving images. Here, examples of the latter are suitably downsized to fit the compact exhibition space that the gallerist Don Soker runs out of his Mission District apartment. The centerpiece of the show, however, is a series of 13 ink-on-paper drawings. Sandwiched in glass and framed in wood imported from Paros, they hang from the ceiling like mobiles, twisting slowly in the air currents. Each is based on a nautical map re-created from handwritten excerpts from T.S. Eliot’s Four Quartets. The words appear as “islands” of nearly inscrutable cursive, which open out into white expanses marked by numerals and dotted lines that correspond to nautical depths. Should you wish to read the texts without eyestrain, a book of Eliot’s poems is available nearby. But the greater pleasure comes from contemplating the objects themselves, a “floating” combination of topographic mapping, concrete poetry and what, in a different context, might be seen as treasure maps. 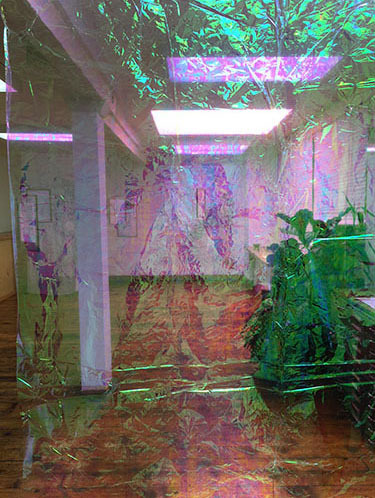 Installation as seen by a smartphone camera through painted cellophane "scrim"
faults as a wobbly lattice; the other shows similar forms bathed in pink or green light; the colors shift according to where you stand. Neither piece by itself generates much excitement. But the light is something else. 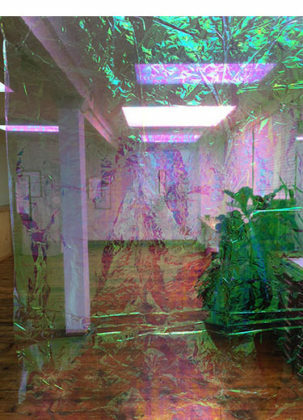 It emanates from a sheet of stained cellophane whose crinkly surface projects colors across the room and onto the fabric. Point your smartphone camera at the cellophane and ghostly figures appear along with a strange green blob: a nearby houseplant, fantastically distorted. I doubt very much that Skandali intended this simple conveyance of light to mimic an experiment in augmented reality, but it comes close. It’s also entirely possible that she actually painted these fugitive forms as a way of surreptitiously injecting a corporeal image – perhaps her own – into the installation. Whatever the case, Skandali appears to have opened a window, one that literally casts fresh light onto (and into) the watery universe she inhabits and so provocatively evokes. Dimitra Skandali: “In my end is my beginning” @ Don Soker Contemporary Art through June 23, 2018.